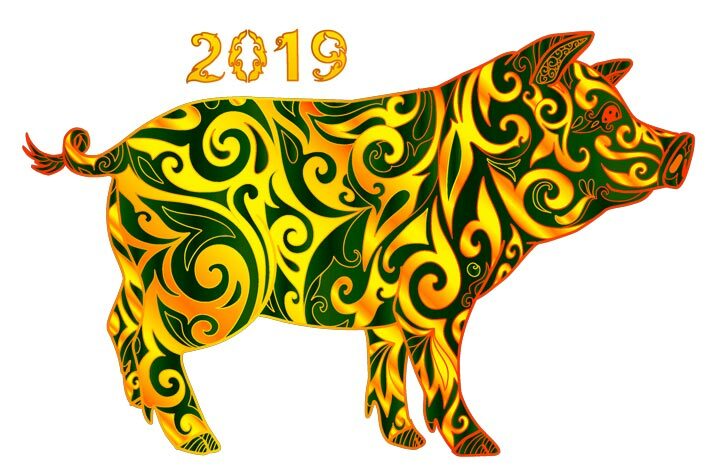 The year of the pig officially begins on the Start of Spring Day, which is February 4, 2019 (11:15am Beijing Time). Start of Spring Day is based on the sun’s position at the 315th degree on the tropical zodiac. The Chinese new year day celebration is based on the new moon day of the first Chinese lunar month, which is February 5, 2019 (5:04am Beijing Time). Converted to USA Pacific Time, the new moon lands on February 4, 2019. The Chinese new year celebration is often called the Lunar New Year or Spring Festival, referencing the beginning of springtime. The Chinese New Year is celebrated on February 16, 2018. The new year day celebration is based on the new moon day of the first Chinese lunar month. 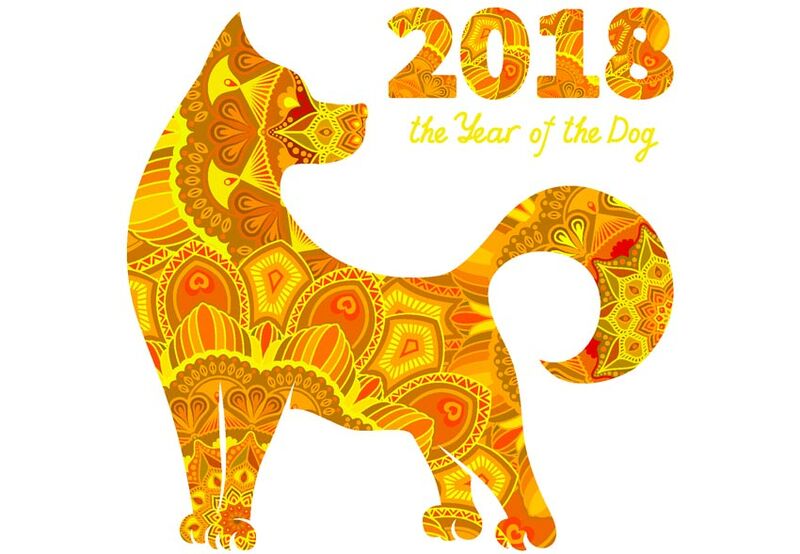 The year of the dog officially begins on the Start of Spring day, which is February 4, 2018. Start of Spring day is based on the sun’s position at the 315th degree on the tropical zodiac. 2017 is the year of the fire rooster. Red is the five element theory color associated with fire and therefore 2017 is the year of the red rooster. The last fire rooster year was 1957 and the previous rooster year, 2005, was a wood rooster year. The time of day associated with the rooster is 5 to 7pm. According to Traditional Chinese Medicine (TCM) internal organ clock theory, this is the kidney channel of Foot Shaoyin time of day. 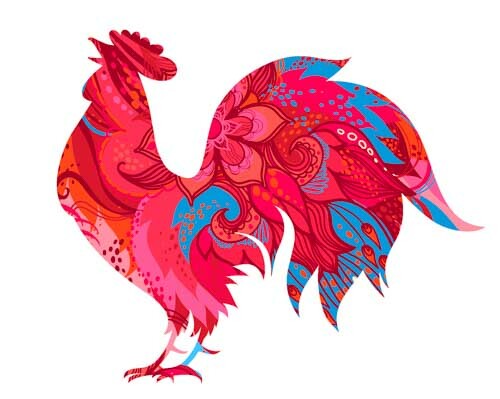 People born between 5 to 7pm have the rooster as their ascendant sign and will have many of the characteristics of those born in the year of the rooster. The fixed element of the rooster is metal and it is a yin sign. Chinese New Year day is celebrated on January 28, 2017. The new year day celebration is based on the new moon day of the first Chinese lunar month. The fire rooster is year 4714 in the Chinese calendar. The fire rooster year officially begins on the Start of Spring day, which is February 3, 2017. Start of Spring day is based on the sun’s position at the 315th degree on the tropical zodiac. The rooster is the tenth animal of the twelve year animal cycle. Roosters tend to be attractive, often proudly strutting about their plumage in a cocksure manner. The rooster’s crow heralds a new day. Expect roosters to be punctual and organized. Roosters are often direct and communicative but may also communicate non-verbally, requiring few words. The decisive and quick minded rooster is independent and alert. A rooster is not inclined to be dependent upon others. The rooster has a fixed metal sign (representing an aspect of money to humans), indicating that the rooster is good with finances. The rooster is a dauntless taskmaster set upon collecting sustenance from the earth. Remember not to ruffle the feathers of this bird. The rooster may become very critical when faced with disagreement. 2016 is the year of the fire monkey. Red is the five element theory color associated with fire and therefore it is also known as the year of the red monkey. The last fire monkey year was 1956 and the previous monkey year, 2004, was a wood monkey year. The time of day associated with the monkey is 3 to 5 pm. According to Traditional Chinese Medicine (TCM) theory, this is the Bladder channel of Foot Tai Yang time of day. People born between 3 to 5 pm have the monkey as their ascendant sign and will have many of the characteristics of those born in the year of the monkey. The fixed element of the monkey is metal. The fire monkey is year 4713 in the Chinese calendar. The fire monkey year begins on the Start of Spring day, February 4th in China. Start of Spring day is based on the sun’s position at the 315th degree on the tropical zodiac. Chinese new year day is celebrated on February 8th in China. The new year day celebration is based on the new moon day of the first Chinese lunar month. The monkey is the ninth animal of the twelve year animal cycle. Monkeys tend to be intelligent, agile, adventurous, playful, and witty. On the other hand, the curious nature of the monkey predisposes them to mischievousness. The naughty monkey may be a bit of a prankster. The fire element in the year of the monkey enhances ambition and adventurousness. 2015 is the year of the wood ram and is the year 4713 in the Chinese calendar. This is also referred to as the year of the sheep or goat. The year of the ram begins February 3, 2015 at 8pm PST on the Start of Spring day. The Chinese New Year is celebrated on the new moon of the first lunar month and lands on February 19 at 7:48am in China and 3:48pm on February 18 in the USA. The Vietnamese new year is celebrated on the same day but the Cambodian, Laos and Thai new year is celebrated in April. The ram is the eighth sign in the Chinese zodiac system and rules between 1 - 3pm. In Traditional Chinese Medicine (TCM), this is the small intestine hand taiyang time of day on the Chinese medicine internal organ clock. The small intestine channel is an acupuncture meridian located on the posterior aspect of the lateral portion of the arm. The small intestine channel receives qi from the heart hand shaoyin channel and continues the flow of qi to the bladder foot taiyang channel in the twelve main meridian circuit of qi. People born between 1 - 3pm have the ram as their ascendant sign and will have many of the characteristics of those born in the year of the ram. The direction associated with the ram sign is south by southwest and the associated season is summer. 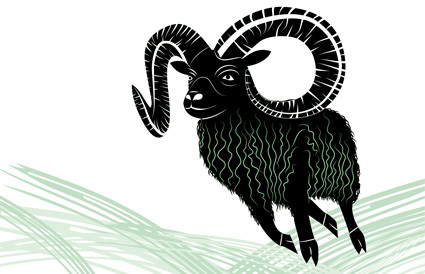 Fire is the ram’s fixed element and 2015 is the year of the green wooden ram. The last wood ram year was 1955. The ram is a yin sign associated with peace and tranquility. Wooly sheep are often loving, sincere, generous, forgiving, gentle and well-tempered. Ram are sure-footed but require protection and consciously avoid becoming prey. Consequently, sheep tend to worry and dislike pressure, criticism and fighting. Ram move with the herd and like to follow, however, ram are equally determined, loyal, careful and conscientious. Interestingly, ram are associated with incredibly good luck. The wood element in the year of the ram lends fortitude and steadiness to 2015. 2014 is the year of the wood horse. The wood horse is also called the green horse because green is the associated color with the wood element in the 5 Element system. The year of the horse begins on February 4th in China and February 3rd in the USA due to time zone differences. Chinese New Year’s Day is celebrated 4 days prior to the astrological calendar change and is therefore celebrated on January 31st, 2014 in China (Jan. 30th, USA). The horse sign rules between 11am and 1pm. In Traditional Chinese Medicine (TCM), this is the hand heart shaoyin time of day and is associated with the fire element. Thinking of dragons? The dragon is also a fire element sign but rules the 7pm to 9pm time period of the hand pericardium jueyin ministerial fire element. 2013 is the year of the Water Snake. The snake is the 6th animal sign of the 12 year Chinese zodiac cycle. Snakes are wise, logical, intuitive, introspective, collected and steadfast. Snakes can be rattled easily by sudden stresses. It is best to avoid becoming rushed and overwhelmed in the Year of the Snake. Peace, tranquility, moderate exercise and rest will provide strength in the Year of the Snake. The wise snake is cautious when making financial decisions. It is best to invest with contemplative reserve and avoid frivolities in the Year of the Snake. 2012 was the Year of the Water Dragon. 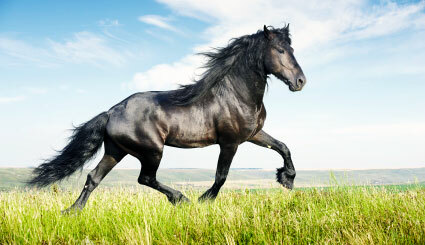 It is the 5th animal of the Chinese zodiac system and its ruling hours are 7am to 9am. The dragon’s polarity is Yang, its season is spring, the direction is East-Southeast, the stem is positive, its month is April and the fixed element is Wood. 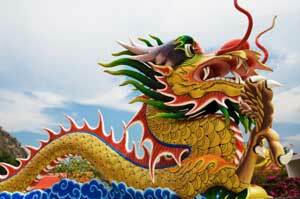 The dragon is considered a lucky sign and is the sign of wealth, power and respect. Dragons have high standards of excellence, confidently strive for success and are filled with energy. At their worst, dragons can be conceited and demanding. 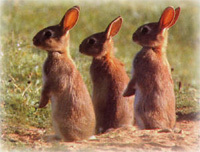 The rabbit (hare) is the fourth animal of the 12 year Chinese zodiac cycle. The rabbit direction is east, the season is spring and the ruling hours are between 5am and 7am. The rabbit’s fixed element is wood and the rabbit is said to be a Yin sign. The rabbit is gracious, amiable, and rabbits make good friends. Rabbits are know to be sensitive, kind, and even tender. However, rabbits can also be moody, stubborn, and appear to be impervious to the opinions of others while inwardly cringing from criticism. At worst, rabbits may be self-indulgent and cling to material comforts and superficiality. Tiger (fixed element Wood): The year of the tiger qualities are traditionally unpredictable, generous, and passionate. Yes, the tiger can also be reckless and have a short temper. Most notably, the tiger is powerful. Focus: Bai Hu Tang, The White Tiger Decoction: There are no tiger products in this formula. 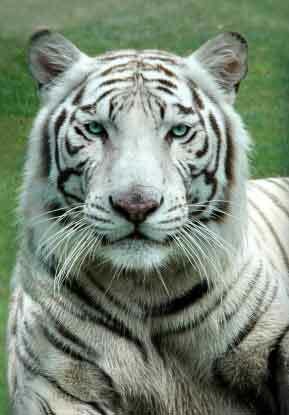 This formula uses raw Shi Gao (gypsum) which is bright white in color as is the White Tiger. Also, it is possible that this formula is named after the metal tiger spirit of the west. This tiger spirit appears in Autumn and marks the end of summer’s heat.